Arcade artwork "Out Run Cockpit Marquee" (SEGA). Restored for Zona Arcade por Mikonos. Comparative samples "Out Run Cockpit Topper". Restored by Mikonos. "Enduro Right Side Arts" (SEGA). Restored by Mikonos & Zona Arcade. Comparative Before - After samples in "Enduro Right Side Arts" (SEGA). Restored by Mikonos & Zona Arcade. "Enduro Left Side Arts" (SEGA). Restored by Mikonos & Zona Arcade. Details in "Enduro Left Side Arts" (SEGA). Restored by Mikonos & Zona Arcade. "Enduro SEGA Switch ON / OFF Sticker". Restored Zona Arcade and Mikonos. "Enduro SEGA Switch ON / OFF Sticker" cabinet position. "SEGA Switch ON / OFF Cabinet Sticker" printed in metallic gray vinyl with gloss protective lamination (photo 1). "SEGA Switch ON / OFF Cabinet Sticker" printed in metallic gray vinyl with gloss protective lamination (photo 2). "Enduro Sega Right Side Art" printed in vinyl with gloss protective lamination (photo 1). "Enduro Sega Right Side Art" printed in vinyl with gloss protective lamination (photo 2). "Enduro Sega Right Left Art" printed in vinyl with gloss protective lamination (photo 1). "Enduro Sega Right Left Art" printed in vinyl with gloss protective lamination (photo 2). "Net City Generic Marquee - Display Card Space" (SEGA). Restored Mikonos & Zona Arcade. Artwork "Net City Generic Marquee" (SEGA). Restored Mikonos & Zona Arcade. "Net City Display Card Space" (Marquee) repro printed in backlite HQ (photo 1). "Net City Display Card Space" (Marquee) repro printed in backlite HQ (photo 2). "Net City Instruction Space" reproduction printed in flyer paper (photo 1). "Net City Instruction Space" reproduction printed in flyer paper (photo 2). "Battle Lane Vol.5 Decal Stickers for Control Panel Overlay" (ROMSTAR). Restored by Mikonos & Zona Arcade. 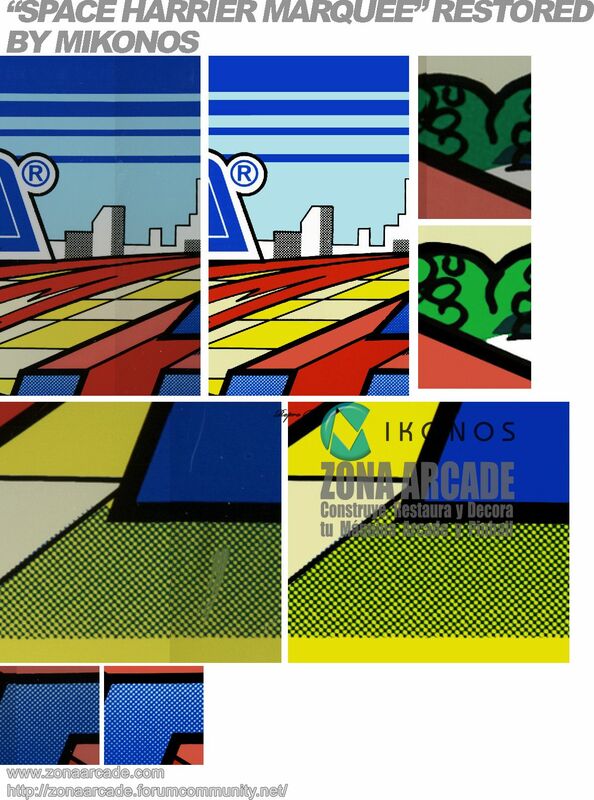 "Space Harrier Marquee" restored by Mikonos for Zona Arcade website. 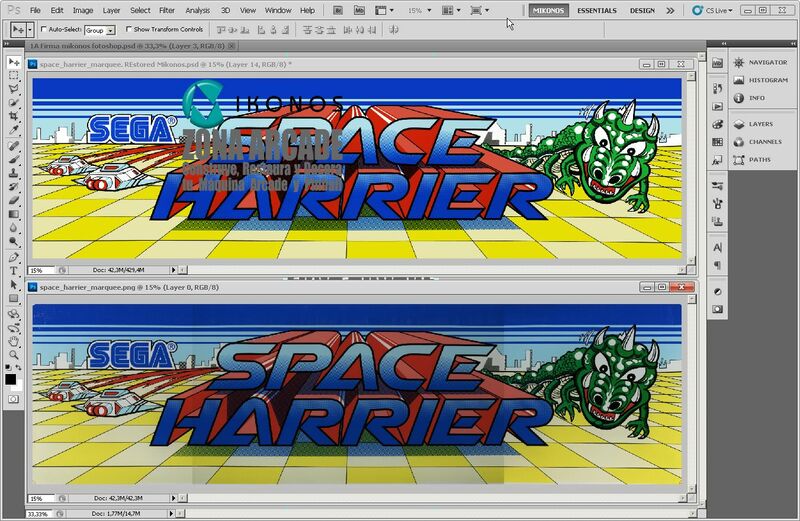 Before-After comparative "Space Harrier Marquee". Restored by Mikonos. "Space Harrier Marquee" (SEGA) printed in baklite HQ (photo 1). Reproduction of "Space Harrier Marquee" (SEGA) printed in baklite HQ (photo 2). 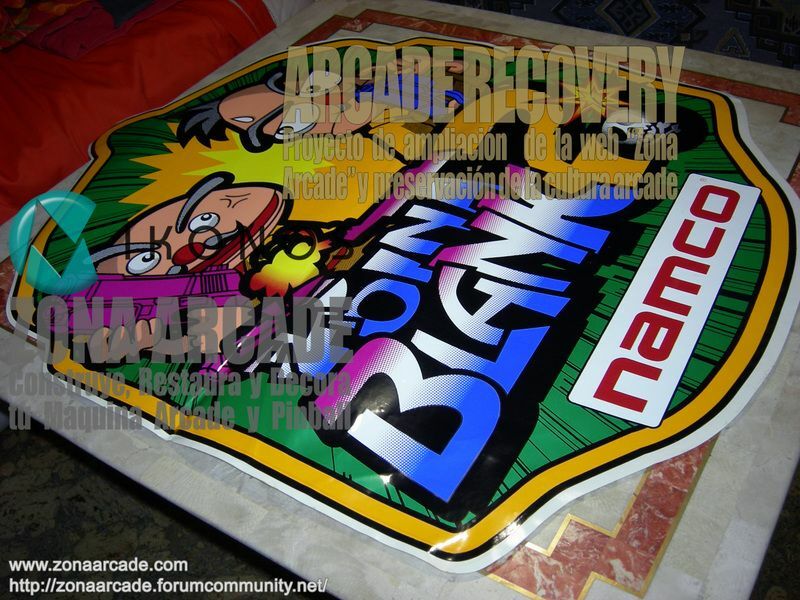 Original "Point Blank 2 Side Art" for upright Cabinet. Original "Tekken 2 Basic Moves instructions Sticker" property of Zona Arcade. 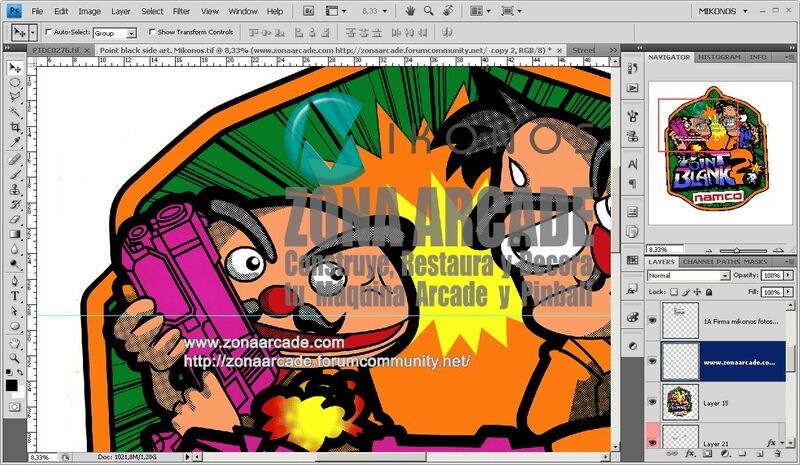 Artwork arcade "Point Blank 2 Side Art" scanned (600 dpi) and restored by Mikonos. Details in "Point Blank 2 Side Art" scanned (600 dpi) and restored by Mikonos. "Status Cabinet Periphery Stickers" (CAPCOM) for arcade cabinet. 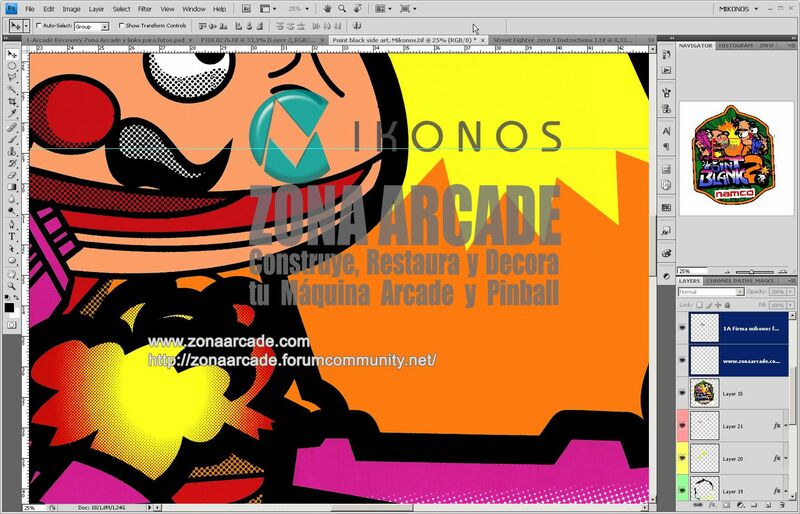 For restoration and reproduction by Zona Arcade & Mikonos (photo 1).